Waste capacity of 1.4 gal (5.4 liters) of dry/solids waste. 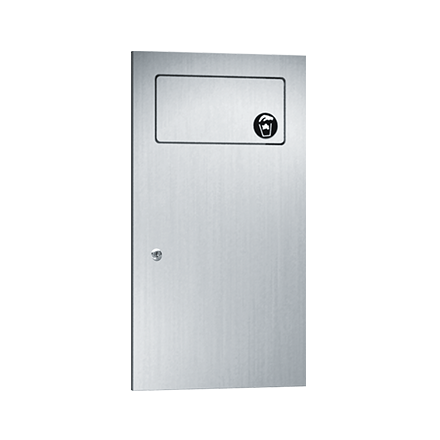 Door includes the international graphic symbol for waste and is held closed with a flat spring mounted in cabinet top. Users push door to deposit waste material into receptacle. Push-door is self-closing. Empty refuse by removing waste container and inverting over collection bag. Safety finger grip on waste container provides convenient grip for service. Locked door prevents unauthorized access or removal.